As a food truck owner, you need to spend time in the prospective facility with a culinary consultant or your staff before you sign a contract with a commercial kitchen. Having multiple sets of hands and eyes on the equipment and layout is helpful in determining the pros and cons of each kitchen you investigate. Foremost, make sure the kitchen has the equipment you need and plenty of space for your staff to work. No matter what kind of kitchen you find in your area, make sure it’s been approved or certified by your local health and building departments. In almost all municipalities in the country, if your kitchen doesn’t have proper certification, your truck can’t be approved for permits. To verify that a kitchen has been certified, ask to see its license. Kitchens are required to place their license in open view. If you find a commercial kitchen that suits almost all your needs but is missing a single piece of equipment you need to prepare your food, speak with the owners of the facility. Most kitchens allow you to bring in additional pieces of equipment if needed. Just make sure the kitchen provides adequate and secure storage for any equipment you supply so you can leave it there. You don’t want to lug large or otherwise cumbersome items in and out of the kitchen every day. When conducting a search for a commercial kitchen, keep in mind that a well-designed kitchen will increase your profits by reducing the amount of kitchen labor required to prepare your food. If your staff knows where everything is located and doesn’t have to run back and forth between stations, prep and cooking times in the kitchen will be more efficient. Assembly-line: The assembly-line design is ideal for a food business that produces large quantities of the same type of food, such as tamales, pizzas, or sandwiches. In an assembly-line configuration, the kitchen is laid out according to the order of use, and the pieces of equipment are generally set up in a line. Zone-style: In a zone-style layout, the kitchen is divided into different blocks. Generally, you have a block for food preparation, a block for cooking, a block for refrigeration, and a block for sanitation and cleaning. The zone-style configuration works well for food trucks that have many types of food on the menu. This layout allows you to prepare in one area while already-prepared food is cooked in another area. Both assembly-line and zone-style kitchen configurations can be (and, if possible, should be) ergonomic. An ergonomic configuration represents the ideal kitchen in many ways. Ergonomic spaces tend to be well thought out and designed for maximum labor efficiency. 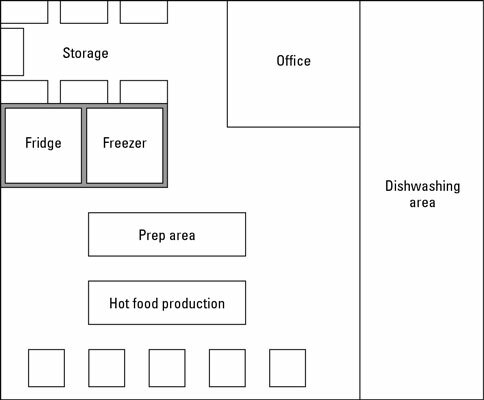 This layout means your kitchen staff spends more time producing your products and less time walking back and forth to prepare the food and clean. Ergonomics operates on the theory that the fewer steps and moves your employees need to make to complete a task, the better. Ergonomics can also help reduce injuries and fatigue. Don’t worry if you can’t find your dream kitchen; finding the perfect kitchen layout can be difficult. You may have to go with a suitable kitchen that can fit you in during the hours you need. Commercial kitchens’ sizes range greatly, and the needs of each food truck owner differ just as much. The average commercial kitchen is roughly 2,000 square feet. The general rule in kitchen design is that for every person you serve, you need 15 square feet of kitchen space. Provide storage space for raw materials. Provide space for food being prepared. Provide adequate storage for your equipment, cookware, and cutlery. Provide enough space for safe movement of staff. Provide an area for checking in stock. Just as important as the locations you choose to operate your truck from, the location of your commercial kitchen plays a similarly significant role. You don’t want to spend a lot of time driving back and forth between your stops and your commercial kitchen between shifts. If at all possible, try to keep your kitchen within 15 to 20 minutes from the majority of your stops. The more time you spend on the road traveling, the less time you’ll be able to spend selling your products or doing tasks in your kitchen or office.